The LG forum let it slip last night that the Gingerbread (Android 2.3) update for the Revolution could start today. Without a change log though, we were a little hesitant to jump on board with that. Well, good news this morning, as the list of changes has been uploaded and published by Verizon. It’s 87.8MB in size and should be on everyone’s phones by 11/2. Be sure to let us know if you receive it! And I guess that leaves the Charge on Froyo? You go Samsung! 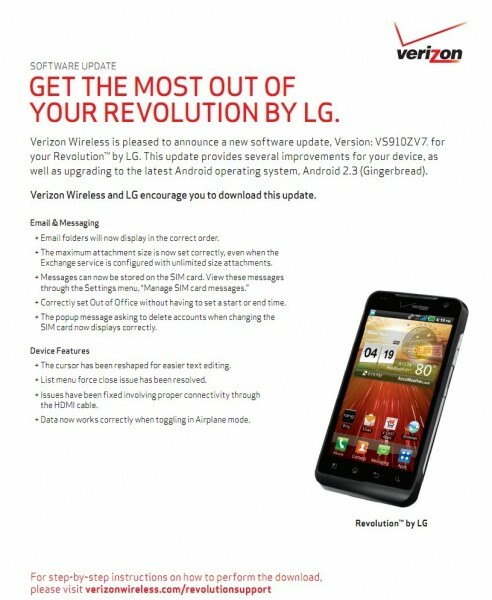 LG Revolution to See Gingerbread Update Tomorrow, October 28? New Google TV Software Finally Introduced, Available Starting "Early Next Week"